The charros (cowboys) of Guadalajara, Jalisco, completed their costume with this stylized hat, then lent it to the Mariachi and hence, it has become the essence of traditional Mexican dress. Puerto Vallarta, Jalisco, Mexico - Everyone who visits Puerto Vallarta knows that a sombrero is a large Mexican hat. Wide enough to protect not just the head but the neck and shoulders, they also have an upturned rim that can deflect water while trotting around the mesa, herding cattle. In actual fact, the word "sombrero" translates as shadower, coming from the root word sombra, which is Spanish for shadow or shade. A chin strap holds the sombrero in place and might be made of anything from leather to ribbon, depending on the occasion or stature of the wearer. Mexicans didn't invent the sombrero. As far back as the 13th Century, there's evidence of Mongolians wearing protection from the elements. It only makes sense that spending the total of one's waking hours exposed to the sky would result in such a creation. The cowboy, both south and north of the border, is the image to which we are accustomed to being associated with the sombrero. A very popular version with a slightly different design is the poblano, which is a sombrero modified from the flat topped Spanish version. The poblano, though you won't often see them in Puerto Vallarta, takes the original sombrero and rounds out the top, making it fit better on the head for rough riding and galloping. 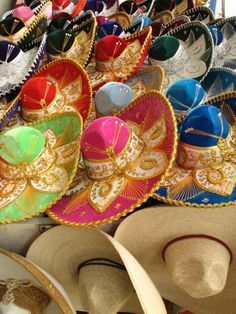 Jalisco, the home state of Puerto Vallarta, is often cited as the origin of the sombrero that we are familiar with today. The charros of Guadalajara, completed their costume with this stylized hat, then lent it to the Mariachi and hence, it has become the essence of traditional dress. The Mexican Hat Dance (Jarabe Tapatío) is a symbol of pride and tells the lovely story of a young man whose most valuable possession is his sombrero. He tosses it on the ground as a gift to woo the girl with whom he is in love. The moves and story of this dance convey the common courtship of a youthful couple.